Today you arrive in Moscow. After some rest, there will be a kick off meeting regarding the tour. We will provide you with the details and itinerary, and give some advice about rules and customs in Russia. After the kick off we will go for a walk and explore Moscow, as well as have a dinner at a nice restaurant with the Russian cuisine near the Kremlin. This day we have an excursion around the city. Starting with Kremlin and Red Square, we will see GUM (The main shopping mall) and Saint Basil’s Cathedral. Later on we will explore the subway (Metro) and have a walk down Arbat, which is the most famous pedestrian street in Moscow, where you can buy authentic Russian souvenirs. In the morning we will go to the Red Square to take photos with the bikes. After that, we leave Moscow and head to Valday. We will have lunch somewhere in the middle of the day, most probably in Tver. Also we visit Valdaisky Iversky Svyatoozersky Bogoroditsky Monastery, one of the most praised places for Orthodox Russians. This night we will spend in the cozy hotel on the territory of the Valdai National Park. Here you will see the authentic household with meat and dairy products and have a chance to take Russian baths. Today we ride through several small towns and villages. 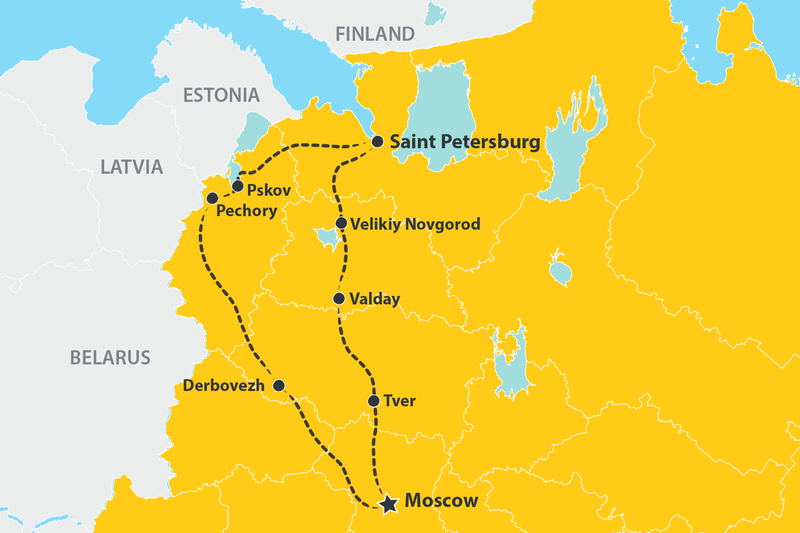 One of the cities along our way is Novgorod – one of the oldest and most famous cities in Russia. It celebrated the 1155th anniversary in 2014. The old Kremlin and Monastery are perfectly preserved in the heart of the city. We also stop in Gatchina and take a look at the Castle and a Park, and have a coffee and catch our breath back. After that, we go straight to Saint Petersburg, check-in in the hotel and have a dinner in the Museum of Russian Vodka. Today we have a sightseeing tour around the city. In the morning we go to Peterhof, where you see dozens of fountains in the Lower Garden – funny and pompous, simple and complex – they have been delighting guests for the last two and a half centuries. From Peterhof we come back to the city center and after lunch continue with the Palace Square, Nevskiy Prospect and other places of interest. Today we go to Hermitage, one of the best museum in the world. It was calculated that you need at least a week to see all exhibits of the Hermitage. We don’t have so much time, but trust us, even half of a day walk will impress you. In the second half of the day we see St. Isaac’s Cathedral and the Church of the Savior on Spilled Blood. In the evening there is a free time. Our plan for today is to visit Pskov and stay for night at Pechory. Along with Novgorod, Pskov is one of the oldest Russian cities. The very old church remained untouched in the very center, in Kremlin. We have a short sightseeing tour around the city and then head to Pechory. It is a small town where we will stay in private house with old Russian interior and real home-made food. After big cities it will be pure relax and joy. We can visit banya, make Russian BBQ or ride along the old sights that are located around the city. Derbovezh is a lake where you can experience fishing, boat tours and real Russian baths (sauna) – if you are ready for it. There are some other activities available: volleyball, sunbathing on the beach, swimming in the crystal clear water, etc. Dinner will be cooked by a local chief, and in the evening we will hear some more stories about Russia, our culture and history. It is our last riding day. In the morning we take a 100 km segment of the highway and after we go to secondary roads. We will finish the day in the best beer restaurant in Moscow with a farewell party!